The effect sounds like an Unlikely super session between Howlin' Wolf and Alfred Jarry (costumes designed by Max Ernst) . His new Magic Band, featuring ex-Zappa sidemen as Bruce Fowler (trombone) and Art Tripp (drums) , handle the demands of the music with disciplined ease, executing Beefheart 's quixotic time signatures and self-deconstructing arrangements with a professionalism that tends toward both perfection and liveliness, usually an unlikely symbiosis in art-rock groups. 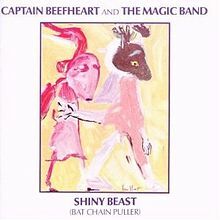 However cerebral Beefheart's music sounds, though, it should be POinted out that Shiny Beast is a fun album, full of good humor and strong material. This time out, The Captain is out to entertain and beguile, a work of art that does what any object of scrutiny must do, which is to offer a genius's blend that confuses, edifies, confounds and elevates the individual attendee . K-Scope - Phil Manzanera (Polydor)- Though K-Scope lacks some of the rhythmic interest and angular improvisations that made his previous Diamond Head record one of the more interesting experimental rock releases of 1976, Roxy Music guitarist Phil Manzanera 's new album one is still intriguingly off the beaten path. The music is a bit more human this time out, i.e. more easilty accessible to a broader listenership, and Manzanera himself keeps a relatively low profile throughout, keeping his guitar chores to setting mood, rhythm duties and occasional fills. The saxophone work by ex-King Crimson member Mel Collins adds an agreeable jazzy drift to the instrumental tracks. Tokyo Tapes - Scorpions (RCA) Recorded live in Japan (the new hard-rock capital of the world), the German Scorpions play their way through four sides of machine-shop heavy metal. The songs are generally undistinguished (this band exhibits little originality in the songwriting department) , the drum work tends to be as rigid as rigor mortis, and the singing, in phonetic English, approximates the sound of a barking dog_ What makes the album a delight, though, is the guitar work of Ulrich Roth. Like Edward Van Halen, Roth's style combines flash (ala Jeff Beck and Johnny Winter), technique (Allan Hold s worth and Harvey Mandel), power (Leslie West a and Hendrix) and taste (Ritchie Blackmore). His solos are swooping, over-powering sorties, with dizzying sonic riffs, fleet-fingered note configurations and screaming obstinate sustains. This leads to a monotonous virtuosity that begs to be paid attention to, though. As is the case with most fret masters in rock and roll, the harmonic palette is limited compared to the full chromatic smorgasbord classical or jazz formats afford musicians given to playing many notes; after a bit , all those scurrying steeple races up and down the guitar neck resemble inspiration and melodrama less and the mechanical fury of factory machines more. Maybe that’s the point.